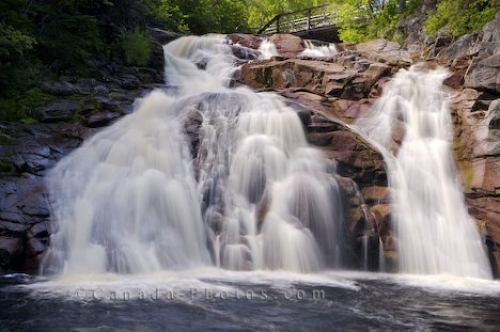 Many visitors come to Mary Ann Falls while visiting Cape Breton, Nova Scotia to see the beauty of the water as it cascades down the rocky embankment. To view the falls, you can use the platforms which most of the tourists do but for the more adventurous there is a short hiking trail where you can get a closer look. Mary Ann Falls, Cape Breton Highlands National Park, Cabot Trail, Cape Breton, Nova Scotia, Canada. Picture of Mary Ann Falls in Cape Breton, Nova Scotia where the water falls for twenty feet into the pool below.